Ski 75+ Nights this season for just $129! No blackouts, no catch, no kidding. Shawnee Peak's Night Pass gets you Skiing every night (except Sunday) from 4pm-close on 19 trails of all abilities, 4 lifts and two terrain parks. This is the best deal for people who work or go to school during the day, but still want to ski several times this winter! $129 Night Season Pass - 19 Trails, Two Terrain Parks, 4 Lifts, 6 Nights/Week! We know that, based on last year’s sales activity, the Night Pass was integral to bringing several hundred people back into the season pass market. Shawnee Peak announces the re-introduction of the hugely-popular 2010-11 Night-Only Season Pass for just $129! Providing skiing and riding six nights per week from 4pm to close, the night pass offers up to 75 nights on the snow this season! The Night Pass price will increase to $149 after October 12, 2010. Shawnee Peak is the largest night skiing facility in Northern New England, offering 19 trails, two terrain parks and 4 lifts lit for night skiing from 4-8pm midweek, 4-9pm holidays and 4-10pm on Friday and Saturday nights. 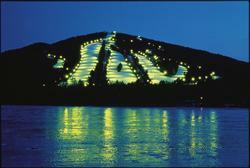 Skiers and riders of all abilities flock to Shawnee Peak at night, due to its close proximity to large population centers, varied terrain and affordability. An individual night lift ticket would cost $25-30 (depending on the night it is purchased), meaning it only takes 4-5 nights for the Night Season Pass to pay for itself. The value of the Night Pass is truly unrivaled. Because Shawnee Peak is located just one hour from Portland, Maine, 1 hour and 45 minutes from most locations on the New Hampshire Seacoast and 2 ½ Hours from Boston, many skiers are able to leave work or school a little early and still get plenty of ski runs in before the lifts close. Because Shawnee Peak grooms most night terrain at 3pm on busy days, night skiers are treated to freshly-manicured snow. To purchase a $129 Night Season Pass, go to shawneepeak.com or call 207-647-8444.